Do your kids need to run off some excess energy? If you haven’t been to Scooter’s Jungle yet, now’s the time to head over and experience some seriously bouncy fun. Scooter’s Jungle, which opened earlier this year, is located in a stretch of light industrial buildings in El Segundo that you would be forgiven for missing entirely if you didn’t know it was there. Once you step inside, however, there’s a completely different kind of energy. 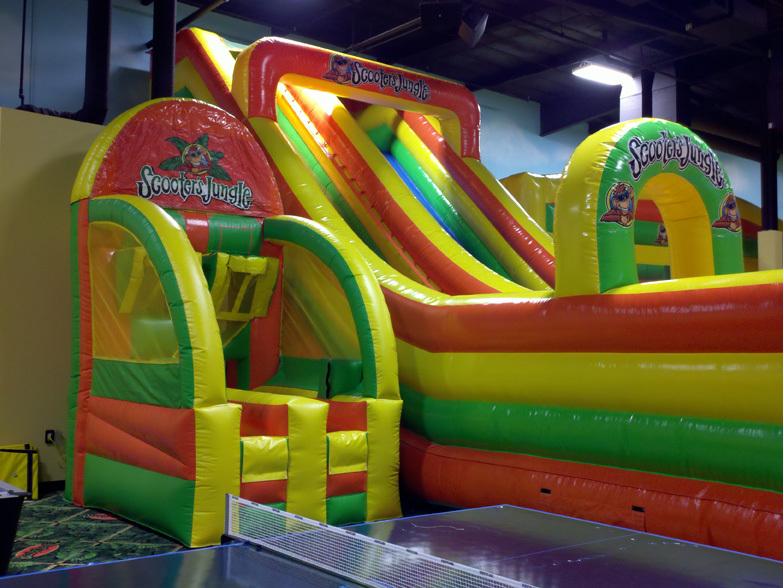 There are two gymnasium-sized rooms with custom-made huge inflatable jumpers and permanent structures. Your kids can play ball in the inflatable basketball court, jump through obstacle courses, slide down enormous slides, and zip across zip lines, landing on a soft, bouncy structure each time. There’s also air hockey, ping pong, a climbing maze, and sit-down scooters. Scooter’s Jungle is available for private parties and gatherings, and the staff is incredibly organized in managing food and drinks (and keeping track of birthday presents!) for big groups. They also offer special toddler and all-age open play times during the week, as well as “Family Fun Night” featuring $9 admission for kids ($4 for adults), $2 pizza slices, and free lemonade and snacks. Check the calendar for details. Did we mention that adults can go on the equipment too? We dare you to resist at least one trip down the slide. Just don’t forget socks for you and your kids. Last, we’ll throw in a bonus tip we learned today from Scooters’ Jungle for managing little bumps and “owies”: Take a single baby wipe, fold it in half, put it in a snack-sized Ziploc baggie, and freeze it for an easy, quick, and disposable ice pack. (Yes, someone went down the slide too fast – but we’re all good.) We’re ready to go back again!